Now more than ever, we need to work harder to educate the next generation to care for our planet. 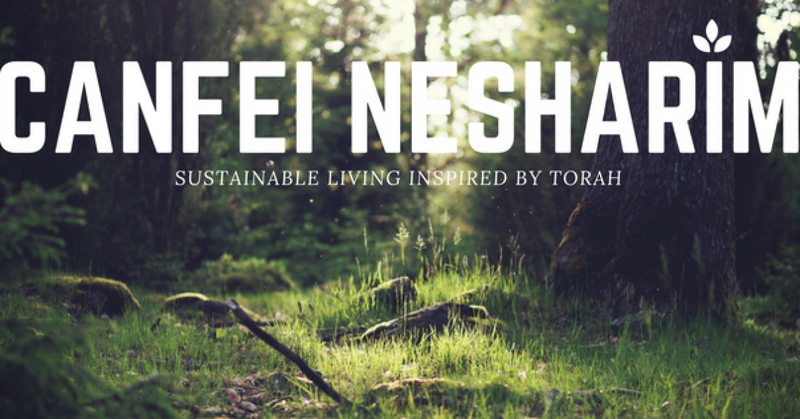 For over a decade, Canfei Nesharim has been on the forefront of environmental education targeting the Orthodox community. This year, we are proud to announce that we are developing a new, cutting-edge curriculum that will inspire orthodox high-school students and their families to envision and work towards a better world where the Jewish community, informed by Torah values, is educated and empowered to take action to preserve and protect our environment. This is no small feat. Despite there being a long history of Jewish teachings about the environment, the majority of Orthodox Jews have not learned them nor connect them with modern environmental issues or action. Since 2004, Canfei Nesharim has been addressing this gap by developing programs and material for synagogues, schools and individuals interested in teaching and sharing environmental perspective based on Jewish values. Canfei Nesharim is now in a unique position to take the next step in building a Torah-based environmental movement by piloting a new educational curriculum, for high school students. Please help us develop this science and Torah curriculum. The Torah is full of teachings and miztvos about caring for our planet that are deeply intertwined with Torah Values. Yet, our communities, and more importantly our schools, do not currently have the tools to educate their students in these teachings. That is why we are asking for your help. Together, we will build an inspiring, Torah-based sustainability curriculum, teach teachers how to use it, and change the “landscape” of orthodox high schools. Evonne Marzouk is the co-founder and former executive director of Canfei Nesharim. She has taught in communities worldwide about the Torah’s wisdom on protecting the environment, and was the co-editor of Uplifting People and Planet. She is excited to bring her expertise in Torah-based environmental education by serving as an advisor to this project. Evonne currently works in the Office of Global Affairs and Policy at EPA. Ora Sheinson is the current President and a founding board member of Canfei Nesharim. She has actively lectured at Universities and Synagogues on the relationship between Halacha and the Environment. She is currently Vice President and General Counsel of SybilSecurity. Prior to working at SybilSecurity Ora worked as an environmental attorney both as in house counsel and as outside counsel at several AM 100 law firms. She is also a certified LEED Green Associate. While studying for her JD at Columbia Law School, Ora published a paper in the Columbia Journal of Environmental Law, discussing the laws of Harchakat Nezkin and how those laws relate to modern American environmental and property laws. She and her husband Baruch currently reside in Hillside, NJ where they are raising four wonderful children. Debbie Glazer has been an innovative educator for nearly twenty years, successfully engaging her students in lessons that inspire them. In her youth, Deborah gained a deep love for the natural world through spending time on her grandparents’ Connecticut farm. She has dedicated herself to helping today’s youth understand the complexity and appreciate the beauty of nature and strongly believes that we can only help guard the balance of nature if we increase our awareness of how vital and fragile it is. Deborah currently teaches at Bnos Yisroel High School of Baltimore. Deborah and her husband have seven children, three fish, and two lizards. As a neurobehavioral toxicologist, Daniel studies the behavioural effects of toxic chemicals that act on the nervous system and brain. Daniel has written science for middle school students which includes the study of live animals and hand on experiences and are being used by over 60 teachers. Daniel is very active in the community and has Jewish learning to a various of age groups, including day school, college and adult. Rabbi Barry Kornblau is the rabbi of the Young Israel of Hollis Hills-Windsor Park, in Queens, NY. He has also served as Director of Committees and Operations at the national offices at the RCA .. He is also a member of the Va’ad Harabonim of Queens. Upon graduation Yale University and ordination from Yeshiva University, Rabbi Kornblau worked for many years on Wall Street as a fixed income analyst, primarily at Goldman Sachs & Co. Rabbi Kornblau and his wife Dina, they are blessed with five children, including a set of twin girls. Benji first gained a deep appreciation for the environment and natural world while volunteering in the vast organic fields of Kibbutz Sde Eliyahu. That awakening and inspiration has informed the way he learns and lives Torah till this day. Benji spent a number of years in Jewish Environmental Education, in formal and informal settings, most recently working for the TEVA Learning Center in Connecticut and the Interfaith Center for Sustainable Development in Jerusalem. Benji currently lives in Jerusalem, where he learns Torah half the day while working to build a more sustainable and spiritually-conscious future. Teaching Teens Sustainable Living Through Jewish Wisdom is being spearheaded by a member of the Charles and Lynn Schusterman Family Foundation network and has been awarded a matching grant. Schusterman is a global organization that seeks to ignite the passion and unleash the power in young people to create positive change for themselves, the Jewish community and the broader world. Learn more about the Foundation here. "really exciting work you guys are doing! I hope you stay in touch with the heart of your mission and reach beautiful places, and touch many people"
"Keep up the good and important work"
"This is the most important work of our time. Keep it up!!" "Thank you for creating this very essential programming." "To our Brother Benji Elson- Keep up the great work and keep helping to sustain our planet!" "To Benji Elson for his hard and inspirational work for this organization and the greater world"
"Thank you, Canfei Nesharim, for your good green work in the Jewish community!" "In honor of the dedicated staff"
Canfei Nesharim has been on the forefront of environmental education for the Orthodox community for over a decade. We are now developing a curriculum that will inspire high-school students and their families to envision and work towards a world where the Jewish community, informed by Torah values, is educated and empowered to take action to preserve and protect our environment. Help inspire one high school students to care for our planet! We'll send you a report on the success of the project, with a link to the fully developed modules for your own use! Help five students become Torah role models! We'll send you a report on the success of the project, with a link to the fully developed modules for your own use! Help us inspire more people through digital platforms! We'll send you a report on the success of the project, with a link to the fully developed modules for your own use! Help a classroom become sustainable! Receive an electronic version of our ebook: Uplifting People and Planet: Eighteen Essential Jewish Lessons on the Environment! Help a grade achieve great things! Receive an electronic version of our ebook: Uplifting People and Planet: Eighteen Essential Jewish Lessons on the Environment! Help a school become an environmental leader! Receive a printed copy of our ebook: Uplifting People and Planet: Eighteen Essential Jewish Lessons on the Environment! It will be signed by the editors!